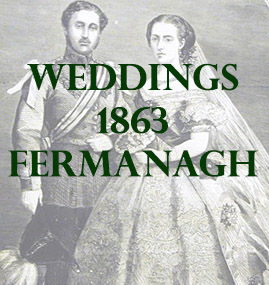 The following list contains marriages that mention places in county Fermanagh. At Rathfarnham Church, county Dublin, Francis John Howard Esq., barrister at law to Elizabeth daughter of the late Rev. John Sweny, rector of Clemish county Fermanagh. At George’s Church, Dublin, Rowland Blennerhassett, Esq., M.D. Killorglin county Kerry, so of the late Henry Blennerhassett, Esq., and grandson of the Hon Elizabeth and Richard Blennerhassett, to Maria Louisa, daughter of the late Hamilton Haire, Esq, of Glassdrummond, county Fermanagh.